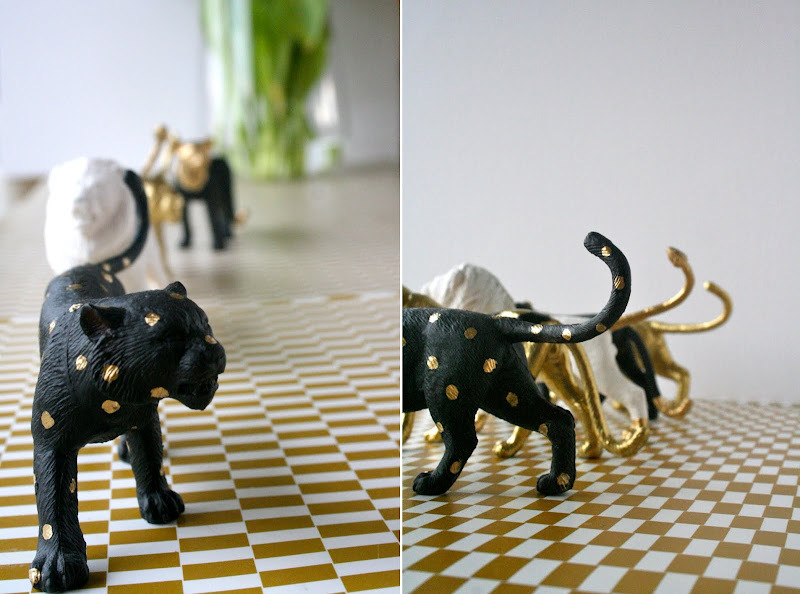 When I came across cheap (and slightly ugly) plastic animals in the toy section of one of our local stores I remembered these golden beauties and decided to make some of my own. Here is a quick tutorial for those of you who would like to make some too. Step 1: Start by spraying your plastic animal(s) with an even layer of spray paint (I used black, gold or white depending on the animal). Make sure you do this in a well ventilated area, and that you use something (cardboard in my case) to protect the area you're spraying on. Step 2: Once the paint has fully dried, you can start decorating the animals. I used a gold metallic pen to draw spots or lines, or to cover parts of the bodies (such as paws, tail or head). Step 3: Once you are done, make sure you let the animal(s) dry some more before handling them too much. I've noticed that the golden paint stays sticky for a while and will get onto your fingers. Step 4: Put them somethere pretty and admire! So cute! I'll definitely be giving this a try. These are increible! your photos are excellent and I am going to the store to find some little critters tomorrow!!! :D Thanks for the tutorial! Oh wow, MrsF: a painted lobster would be A-MA-ZING! What a shame indeed! I'm going to have to keep an eye out for one of them. Wow - your dinos are super cool!! Love the colours you chose. i bought them at hema, in the toy section - they are super cheap (€1 each) and they also have lots of farm animals (pig, horse, goat, sheep, etc.) and dinosaurs - they are pretty ugly to start with, but have a great deal of potential once sprayed! Hema, of all places! :-D Too bad it's a Sunday today... 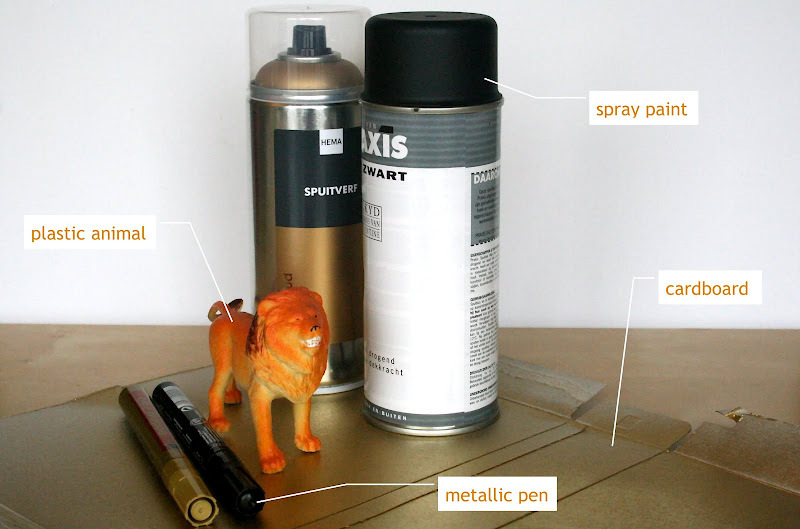 Tomorrow I will have my spray painted animals! perfect idea, thank you for sharing. I have a plastic hippo I think I will paint. Thanks for the inspiration! I would love to see it when it's ready. Oh your beasts look beautiful! What an interesting trend - love it!! 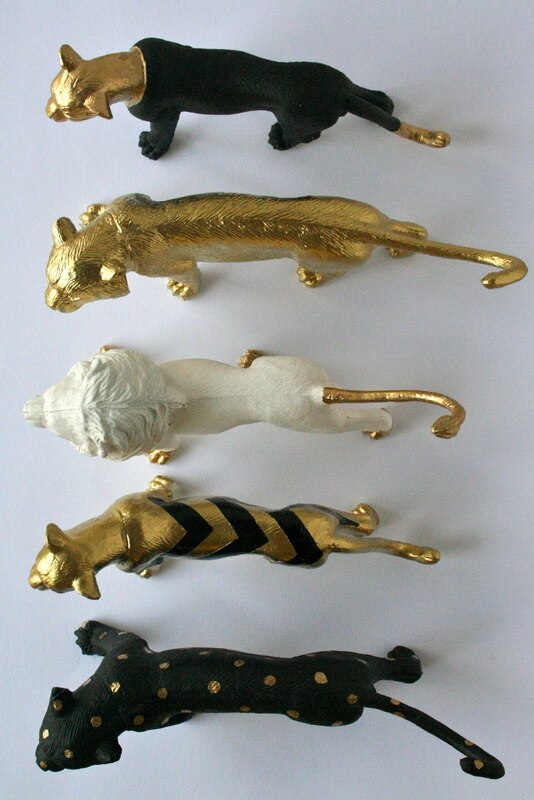 I've got this linked to my painted animals DIY post as well today, for different ideas! did you use tape or something to make the chevron pattern? Yes, I used tape. I have to say though, when I sprayed the taped tiger in gold some of the paint went under the tape and so once it was dry I took a black pen and fixed the golden little smudges. Why should love be pink?